Following a successful trial last June, the first three boarding gates for UK domestic flights departing from Heathrow Terminal 5 are now open, and more than 4,000 customers have already benefited from the new technology. 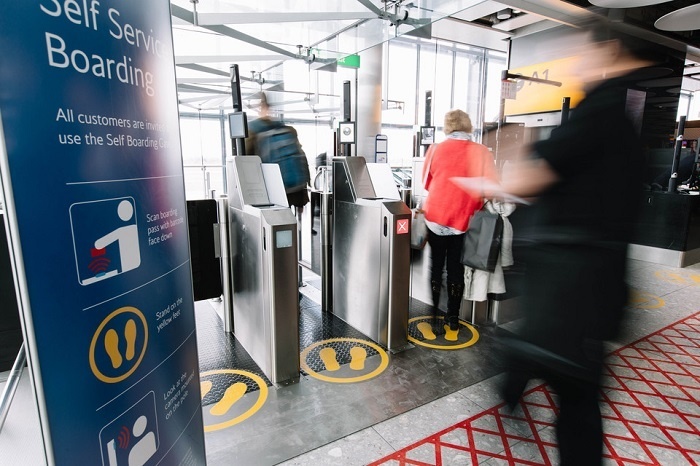 The gates create a smoother journey for customers as they travel through the airport, with travellers scanning their own boarding pass when they arrive at the gate and then simply walking through to the aircraft. A digital facial scan of the customer is recorded when they travel through security, and when they arrive at the gate, their face is matched with this representation when they present their boarding pass – allowing them to board the aircraft. Safety and security is at the core of the biometric facial recognition technology, with British Airways claiming its equipment is more advanced than alternative systems currently used by other airlines and airports. Three more British Airways self-boarding gates will open at each domestic departure stand each week until mid-June, with a view to roll-out the scheme on international flights in the future. The introduction of the new gates is part of wider investment into new technology that will enhance the experience British Airways customers have during their time at the airport. British Airways has also opened self-service bag drop points at Gatwick and Heathrow, and later this year will introduce an improved, more streamlined connections area at T5. Troy Warfield, British Airways’ director of customer experience, said: “Our customers have told us that they want the ability to simplify and speed up their journeys through the airport.